A lot of people don't know that the skin reflects the food you eat, your surroundings, your exercise habits and of course the nutrients you feed to your skin - it's almost like how you keep your body healthy. 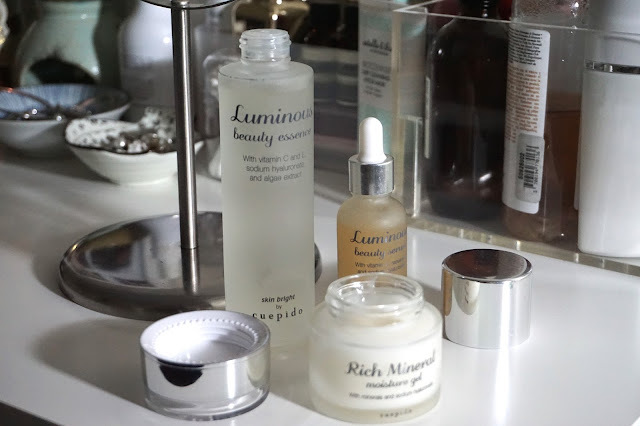 Below are some tips that might get you started on changing up the little bits and pieces of your lifestyle - but let me start with a skincare routine that has kept my skin looking healthy and resulting me to have that glow from within. I've always loved products that have natural ingredients - anything in relation to plants or fruits, basically, I think they are the best form of ingredients. Say hello to Cuepido Cosmetics, which is known to formulate without parabens, phthalates, triclosan, sulfates and gluten. Hence, products are safe to be applied on the skin and have lesser possibility to allergies. 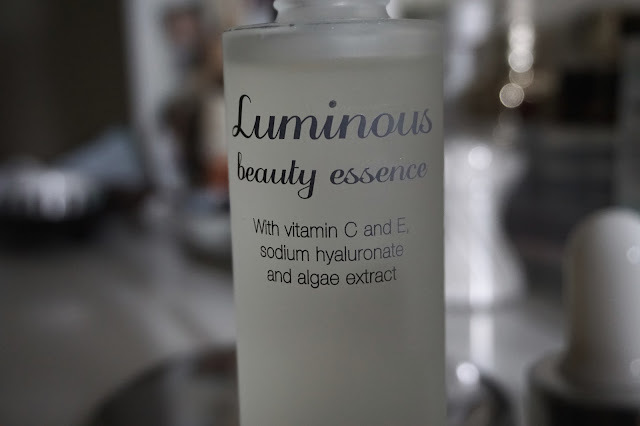 Luminous Beauty Essence - If you are the kind that likes a glowy finish to your makeup, this is something you should pick up to be applied under your foundation. Best part about it is that it has Algae extract in it which is awesome for hydration boost and helps to minimise dark spots. I enjoy using this in the morning especially, because it absorbs perfectly and results to super healthy-looking skin. 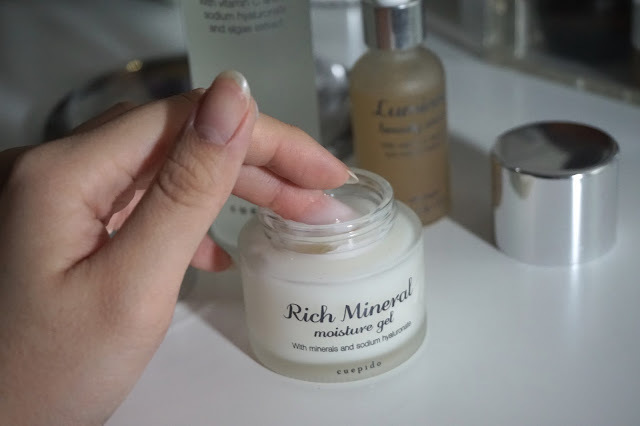 Rich Mineral Moisture Gel - It's almost crazy how lightweight and breathable this moisturiser is. 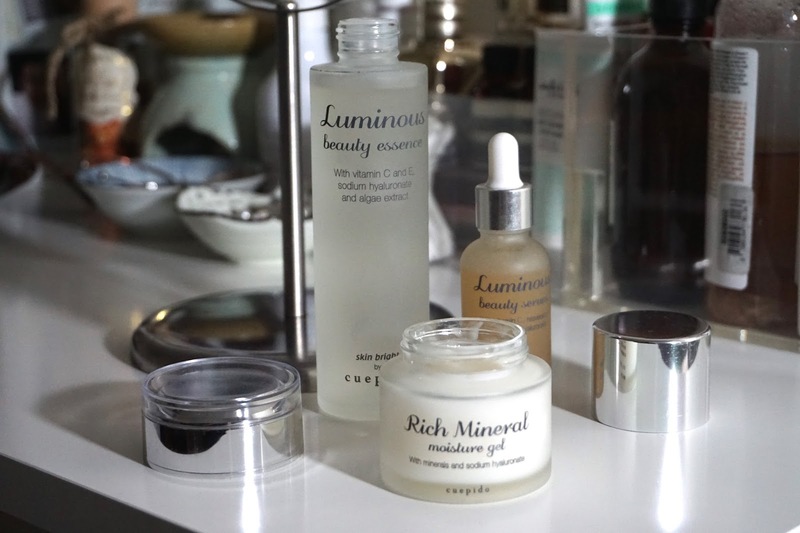 The last thing you need in a moisturiser (especially for during the day time) is the thick, oily and heavy layer of oil on the surface of the skin - been there. 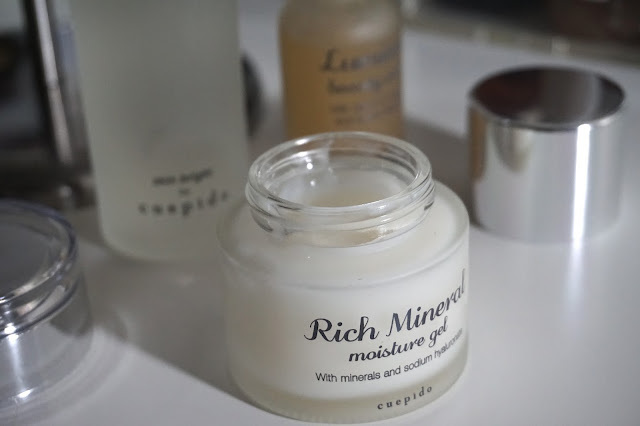 It's amazing how much good moisture and nutrients this gives to the skin at the same time making you feel like you're not putting any skincare on at all. 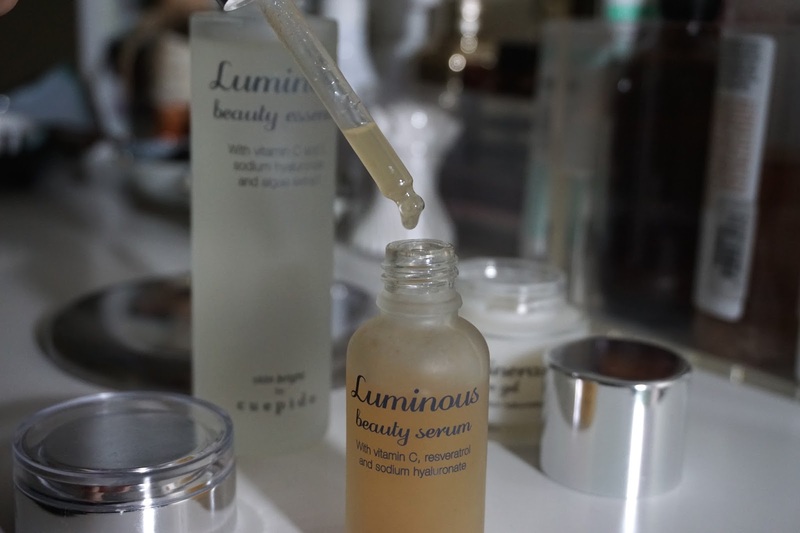 Luminous Beauty Serum - This is actually a lovely addition to the range. It's probably my favourite from the entire range, maybe because it smells like dried oranges and grapes - super fruity! 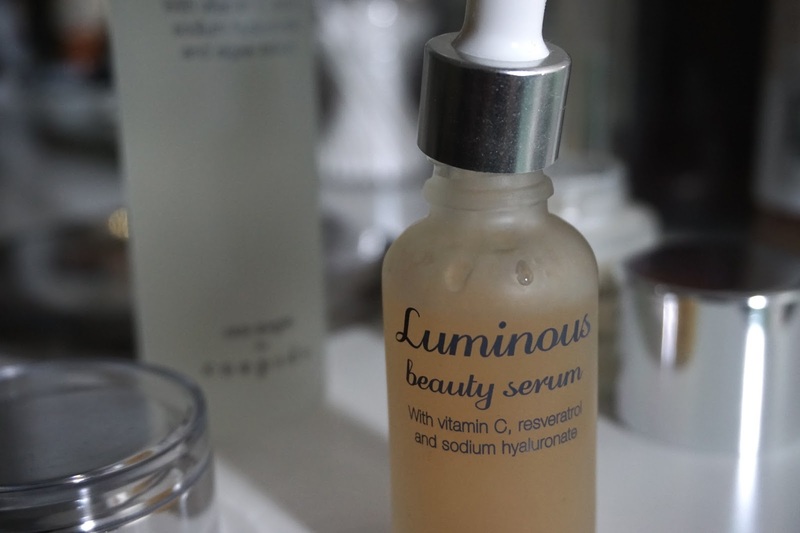 This serum protects the skin against free radicals (free radicals are unstable atoms caused by pollution, sunlight and help to reduce hyperpigmentation from sun damage. It's like feeding your skin with fruit juices everyday :) I love it! Done with the skincare, here are some tips on how you can switch up your lifestyle to achieve healthier-looking skin. TIP #1: Stay hydrated! Or get a bigger water bottle. You've heard it too many times, you don't need me to tell you how many litres of water you need to drink a day. But if you are clueless, it's 2. The only problem that we are all facing is HOW to get ourselves to drink that 2 litres. I find that the easiest and most bimbotic way to solve this problem is to either get a bigger water bottle. For one, so you do not need to keep refilling, especially when your office desk is a long walk away from the water dispenser or simply get a cute/nice/pretty water bottle so you don't mind using it more often. Eating the right kind of food can really help to improve your skin condition. I always find that whenever I'm eating healthy, my skin reflects it too - try to not consume too much fried food or fast food but instead, whenever you're hungry or feel like munching, be sure to always stock up some fresh fruits to munch on! Sometimes, it's not the skincare that causes your sudden breakouts, it could simply be that you've been sleeping in a garbage can the whole time. Sleeping is important not only for the eye bags but this is when your skin takes a rest and to regenerate - that's why you call it a beauty sleep. When this happens, be sure to keep your area clean and dust-free, do not eat on your bed (no breakfast in bed unless you have a maid who can change your bed sheets for you every day) because you don't want to sleep with insects and you don't want so much dirt on your face. Really, I've seen many girls punching bags with their makeup on. I really don't understand the logic. One, it's not comfortable. Two, your makeup will (100% will) smudge - so that kinda beats the purpose of putting on makeup anyway right? Anyway, it's always good to bring along cleansing wipes with you to remove your makeup efficiently before you head to the gym. When you gym, your body generates the heat which will open up your pores and the makeup with sip into your pores and will possibly create pimples. 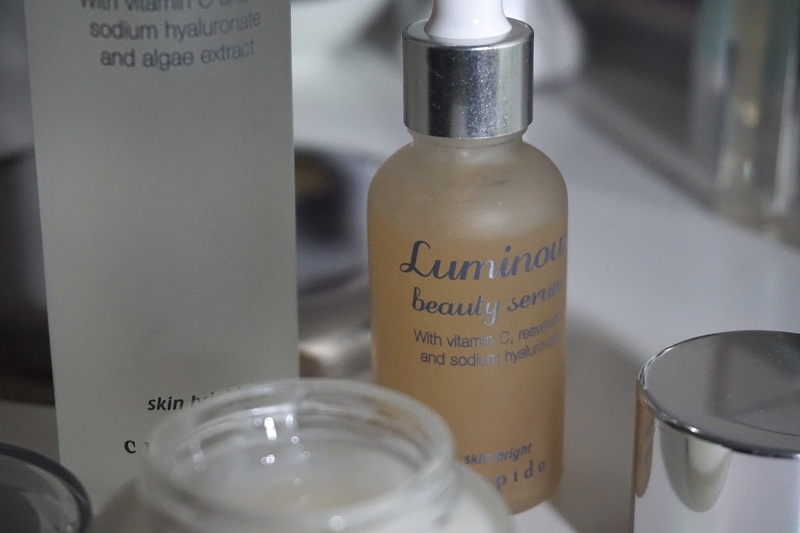 I hope this article inspire you to pay more attention on your daily habits and choosing the right skincare for your skin concerns.